The Brookings Institution has just published a fascinating map that tells us a good deal about what is happening with American manufacturing today. It isn’t surprising that these three states correlate with the historic heart of the automotive industry in America. Not coincidentally, those same states also registered a massive lurch towards the political part of the candidate in the 2016 U.S. presidential election who spoke most vociferously about the loss of American manufacturing jobs. 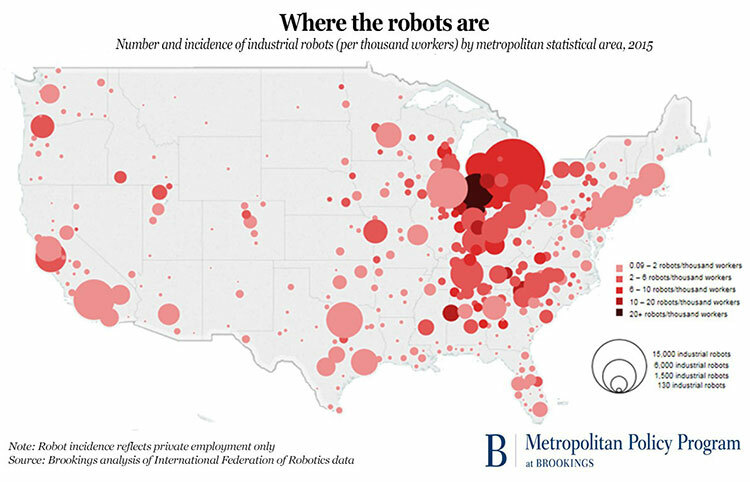 The Brookings map, which plots industrial robot density per 1,000 workers, shows that robots are being used throughout the country, but that the Great Lakes Region is home to the highest density of them. Toledo, OH has the honor of being the “Top 100” metro area with the highest distribution of industrial robots: nine per 1,000 workers. To make it to the top of the list, Toledo’s robot volume jumped from around 700 units in 2010 to nearly 2,400 in 2015, representing an average increase of nearly 30% each year. When one consider that the automotive industry is the biggest user of industrial robots – the International Federation of Robotics estimates that the industry accounts for nearly 40% of all industrial robots in use worldwide – it’s obvious how the Midwest region could end up being the epicenter of robotic manufacturing activity in the United States. It should come as no surprise, either, that investments in robots are continuing to grow. The Boston Consulting Group has concluded that a robot typically costs only about one-third as much to “employ” as a human worker who is doing the same job tasks. In another decade or so, the cost disparity will likely be much greater. What do you think? Are Messrs. Acemoglu and Restrepo on point here – or are they off by miles? Please share your thoughts with other readers.